Member of Yami, and a master level Lucha Libre wrestler. He is known as the Smiling Steel Fist in the One Shadow Nine Fists due to his flamboyant and goofy personality. His Yomi disciple is Rachel Stanley. In the D of D tournament arc, he is the sole representative of the Nine Fists on the island and acts as the tournament's referee. It is because of him believing in a man's romance of trespassing that allows the Shinpaku Alliance to participate in the D of D tournament. His symbol is steel. He believes that a fight must always have an audience and that the fight is for the audience's enjoyment, he also believes that after a fight the loser must obey the winner's choice of killing them or not. He has been shown to always be smiling or laughing even when angered. His personality seems to have rubbed off on his disciple since her views on fights are the same as Diego's. Diego and his disciple, Rachel Stanley have, unknown to the other members of Yami, made preparations for Rachel to fight Kenichi. Said plan involves inviting Kenichi and the master of his choice to a tag team battle against Rachel and Diego. Refusing the challenge or bringing an additional master would result in a bomb being set off. He is surprised to find Renka arriving with Ma Kensei but seems willing to go on with the battle. However, it is later revealed that the true show is the soon to be explosion of the ship, described as his "Murder Show". Upon a fiery backlash by the enraged Kensei, Diego loses his composure and takes off his "Smiling Mask", only revealing there to be another mask underneath. This shocks Rachel and causes panic among several of the audience; and Ma Kensei refers to this as Diego's true face; "Angry Steel Fist". Upon this state, Diego battles with Kensei with powerful, ferocious attacks, even bringing the battle out of the ring and apparently not caring for the safety of his precious audience in the brawl. It is revealed that he no longer regards these people as 'audience', them being targets on Yami's list of elimination. The realm audience gathered in ships further off, watching the battle via real-time screening. Diegos tried to keep Kensei in the air since there is nothing a Lucha Libre can't defeat in the air. However he is defeated when Kensei got back on the floor and said that the earth belongs to Chinese Kenpo. 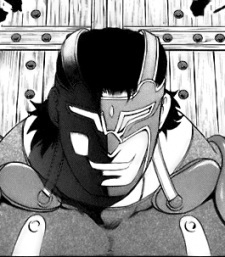 After his plan was thoroughly foiled, with the intervention of Miu, Kenichi and Furinji Hayato, at the point of defeat of the climax of the battle, he took care to make sure the camera angles were all fixated on him till the end, and declared that it was 'Diego Quality' for him to even lose spectacularly. He offers his mask to Kensei asking to be killed only to be denied, only for Kushinada to arrive and throw him overboard. He was saved by elder and is going to Big lock. Diego fought Kensei in a ring with a cement floor. His body is said to be steel hard so most attacks don't hurt him. He also has amazing speed such as when he got around Kensei and trapped him in a headlock.